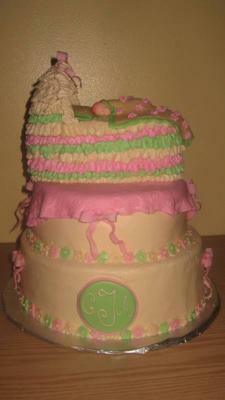 To make this baby shower cake, I started by baking a 10 inch round cake, an 8 inch round cake and a small oval cake. A few days ahead I cut the flowers out of gumpaste using a small flower cutter. I also made the bows out of gumpaste and allowed to dry. I also formed the bassinet canopy our of gumpaste and put in a large plastic egg to harden. I made the monogram plaque out of fondant. I rolled fondant out and used the Wilton imprint roller to put a pattern on the fondant that I placed on top of the 8 inch cake. I iced the cakes using buttercream and stacked the 10 and 8 inch cakes. I rolled fondant out and used the Wilton imprint roller to put a pattern on the fondant that I placed on top of the 8 inch cake. The oval cake I had to carve off a bit to fit the canopy I had made. I put a border around the round cakes and added the flowers. I then attached the bows and monogram plaque with buttercream. I stacked the oval cake on top of the 8 inch and then attached the canopy with royal icing. I put ruffles all around using a tip 103 and buttercream. I made the pillow out of fondant using the Wilton ribbon cutter and the small flower cutter to do the imprint. These were also used for the baby's blanket. I added buttercream flowers to the blanket with a star tip. I formed the baby's head out of fondant using a clay flexible mold for the details. The baby's body is just a lump of gumpaste. VERY GOOD JOB! VERY CREATIVE AND VERY PRETTY!!!! !